Today, while helping someone find some of the code that implements SHOW VARIABLES I was reminded at how insanely complex it all got with the information_schema implementation and the changes to the SHOW commands that came with it. Specifically, I was trying to find exactly how the SHOW VARIABLES output gets populated — what the source data is. By way of example, I present the code to implement it in 5.1.51 (the new way), and in 4.1.21 (the old way). I, at least, have a much easier time sorting out the old way. They both start with the same basic entry point, in the parser, in show: within sql/sql_yacc.yy. The show token just does some initialization. The command-specific work is done in show_param, but prepare_schema_table just sets up essentially a temporary table. Through a few hoops, and sel->add_table_to_list(…) adds the new temporary table to the select list. The schema_tables array lists all of the information_schema tables and how they are each populated. And then show_status_array just knows how to return a SHOW_VAR *, the real work happens in enumerate_sys_vars. And finally the SHOW_VAR *result can be populated from the in-memory structures, in this case the system_variable_hash. The same basic entry point. The SQLCOM_SHOW_VARIABLES is saved for later use, denoting what kind of SHOW this query is. In mysql_execute_command a mega switch statement decides what function will handle this query. And the magic happens here, in a single function. Much simpler, in my opinion. Yahoo! Alerts not updating RSS feeds? I have been using Yahoo! Alerts to alert me to changes in my custom RSS feeds, crawled from CalTrans, for changes in the status of Interstate 80 over the Sierra. I noticed today that although my RSS feed has picked up the recent changes, Yahoo! Alerts doesn’t seem to be crawling it, and their view of it is 5 days stale at this point. There is no “refresh” button on Yahoo! Alerts, but I can see their list of items matches up with 5 days ago in my feed. I have it set to send me changes “as they happen”, since I need to know the road conditions to drive back and forth to Reno. Anything else is kind of worthless. What’s up with that? A week ago I got a useless invite for Yahoo! Mash — useless since the service wasn’t open even by invitation yet, and required a Yahoo! Backyard (employee only) login. The service has now officially launched, so I gave my invite a try again, and it worked! It’s invitation-only, so forgive me if you can’t follow along. There seems to be a damn good reason it is invitation-only… it is totally lame. It is nowhere near ready for the public, embarrassingly so. It’s kind of amusing actually. Lots of things are broken, several things want you to type in e.g. size of pictures in pixels. The lameness comes from many things, not the least of which is that it comes with a “Mash Pet” which is kind of a Tamagotchi composed of pictures of a whiteboard smiley face. The service overall is like a mix between MySpace and Facebook, and overall pretty lame. Actually, the only thing that it seems to have that is innovative (and a feature people have been wanting for YEARS) is a “this is fugly” link to turn off the custom styling of a profile. Yawn. MySQL has a new section on their site about MySQL 6.0, which they are now calling “ready for pre-production testing”. I’m not sure when this section appeared, but I don’t spend much time on the MySQL site outside of the manual and downloads sections. Browsing around this new section I found a real gem: “Top Reasons Falcon is Cool” (or, as alternately titled on the page itself, “Top Reasons to use Falcon for Online Applications”1 … did someone forget to rename one or the other?). This page gives a top ten list2 of reasons why one should consider using Falcon, the new “not an InnoDB replacement, not at all!” but “really, you should try migrating your InnoDB application to it” storage engine. There is no complexity whatsoever in terms of configuration as only a handful of variables exist to control the behavior of the Falcon engine. Hmm, s/bug/feature/ and you’re done! It’s so easy to configure! Extreme degrees of high availability are easily accomplished for a Falcon-driven system by using either MySQL replication or supported third-party high availability solutions such as DRBD. This has nothing to do with Falcon, whatsoever. Falcon’s design takes advantage of multi-core systems to provide parallel execution of user and service threads. Falcon uses fine-grained multi-threading to increase parallelism with locking on internal structures being done at a low level. In some cases, two threads can change different attributes of the structure at once, because the attributes are separately lockable. Yay! Awesome! Parallel execution! It’s finally here!!! Oh, wait, they don’t mean parallel execution of queries they mean parallel execution of internal threads. That’s nothing new, and InnoDB is already doing that. Maybe Falcon has finer-grained locking and can do this better, but that doesn’t make for a big bold title of “Parallel Execution”. Come on, folks. Try harder. 1 Who else gets a headache from American rules for capitalization of titles? 2 How trite, yet another top ten list. Clearly the best deal is the 3-at-a-time plan, but why give the customer a slightly worse deal for each level they go up? Currently, upgrading to the 4-at-a-time plan has quite a premium, $7, for the additional movie. Each additional movie after that is a negligible but still annoying bump in price. The 6-at-a-time plan is the worst deal, since you can get two 3-at-a-time plans for $2.01 less per month. So we’re sitting at our gate in the terminal in LAX, and Citibank has purchased some likely very expensive advertising space above our heads, for “CITI MOBILESM“. Purportedly, this would be a version of Citibank’s website optimized for the mobile browser. The ad has the url citi.com/citimobile which, one would assume, given the mobile target audience (and, my first thought was “ugh, that’s an unnecessarily long URL to type on a mobile”), and the big picture of a phone, should be visited on your phone. How wrong I am. 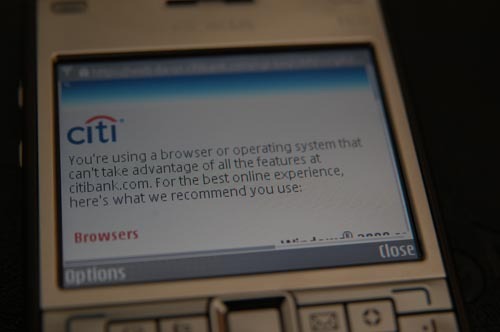 I tried it on my phone, and I got a very large Citibank-standard page (which would likely only render at all on Symbian S60 or iPhone) telling me that I am using an unsupported browser, and helpfully recommends IE, Firefox, Netscape, Safari, and AOL. Awesome experience so far, Citibank! I try it on my laptop, and the reason for that page becomes clear. 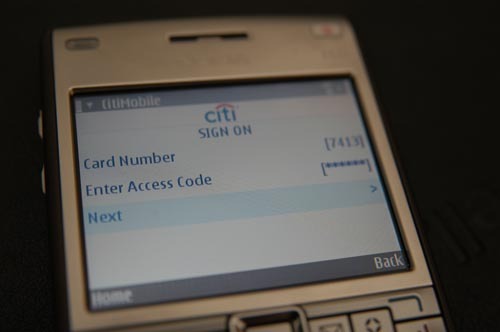 citi.com/citimobile is not supposed to be used from your phone… apparently you’re supposed to go there on a PC and sign up to receive the application as an SMS containing a link to download the application. How annoying. Whatever, let’s give it a go. After going through a fairly simple signup process (none of which actually would have required a PC browser), I am sent an SMS message and I download and install the Java application. The application itself is quite simple, and in fact I suspect based on its behaviour that it doesn’t have any intelligence of its own… it seems to download its menus and such on first run. So, basically, a poorly designed browser. Account Info — Get your account balances, recent activity, etc. 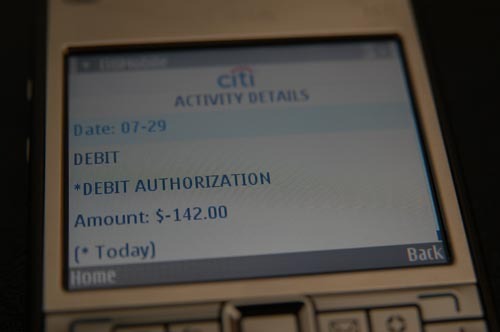 Payments — Schedule bill payments. Transfers — Make transfers between your accounts. 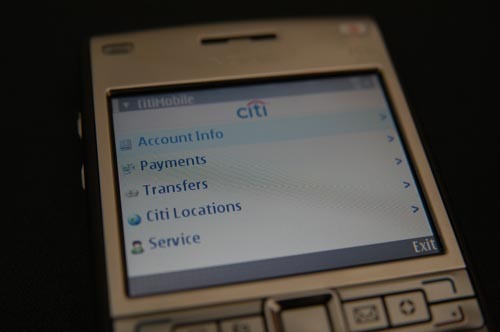 Citi Locations — Find Citibank branch and ATM locations. Service — Customer service and account management stuff. Choosing any of these options except for “Citi Locations” will ask you to log in. The first time you use it, the login process is a bit different… it asks for your phone number using a menu which took me a few minutes to figure out, since it completely deviated both from my phone’s interface, and any interface I’ve ever seen. For future logins, it uses the same kludgy interface to ask for your “telephone access code” aka password. After pressing the middle key (usually “select”-ish) on my phone a few times, and expecting the usual “numeric entry” screen to come up, I finally figured out that you actually have to type on this screen, while the entry you’re typing into is highlighted. On my phone, that means I have to hold down the function key to type numbers. Folks, phones have interface standards and especially Java has standard interfaces for a reason—so that your users won’t be confused, and your application will look and feel like all of the other applications on their phone. To make matters worse, both the Account Info “recent activity” and Citi Locations search are next to useless. The recent activity gives you basically no information, not even the name of the vendor/company, very similar to the information that an ATM will give you as a printed receipt of activity. Overall, a pretty disappointing experience with Citi Mobile!